Sunrise was a warm 80 degrees and humid and the birds lay-low for the first few minutes of the hike. Even the Cardinals didn’t peep until we rounded the karst features and the trail opened onto the first meadow. Then things started to happen, although slowly. The large meadow before the Learning Tree held the most promise. Fourteen birders woke with the sun to observe the birds at the park and in the fields to the east of Wonder World Drive. Most common was the White-winged Dove whose season is upon it. We did manage to spy a Blue Grosbeak, a Baltimore Oriole, although silhouetted at the top of some trees, a dozen Lesser Goldfinch, mostly in the meadow and one Loggerhead Shrike. 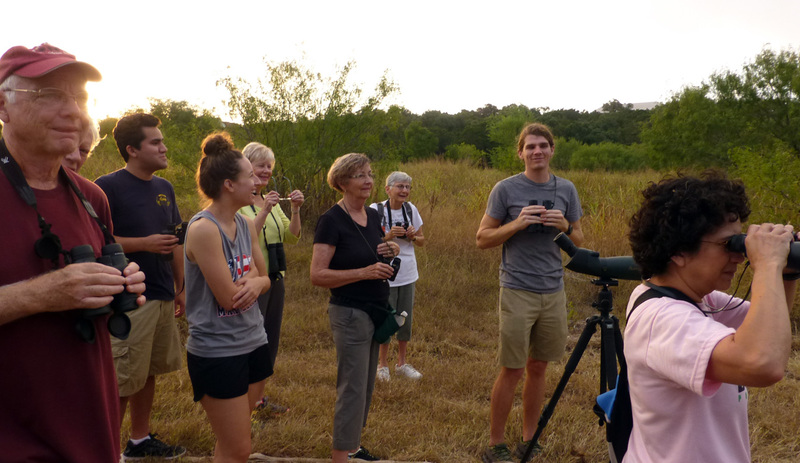 This was the fourth-year anniversary that Stephen Ramirez has led the monthly birding hikes. The first adventure in September 2011 was at Spring Lake next to the Meadows Center — before it was called that. During this time he has missed but maybe three outings and those were always covered by his fellow enthusiasts Jonny Scalise or Colton Robbins. Complete lists of most of our outings can be found on eBird.org or by reading previous posts on the LOOP.